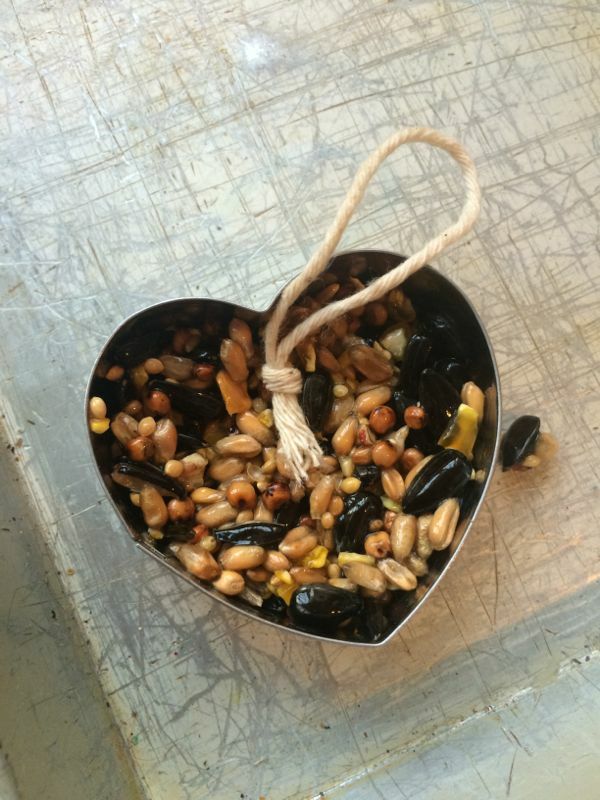 I love the way these little birdseed heart s have turned out – so sweet and the perfect (practical) craft for Valentine’s Day! When I saw this idea on Pinterest I was so excited! I mean, I have to be honest and say that Valentine’s day in our house has never really been something that has been much celebrated between the kids and us. I wish I had time to cut carrots into hearts for tea, but I cut them first and then forget what I was meant to be doing, only to decide later that I will do it another time. 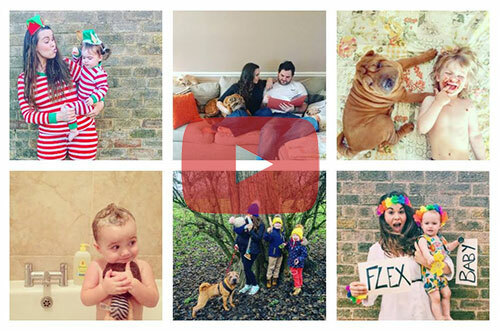 We do the usual heart print patterns, but they are just for us to see and not really something I need to share on the blog – it’s hardly something different that you won’t have all thought of right? 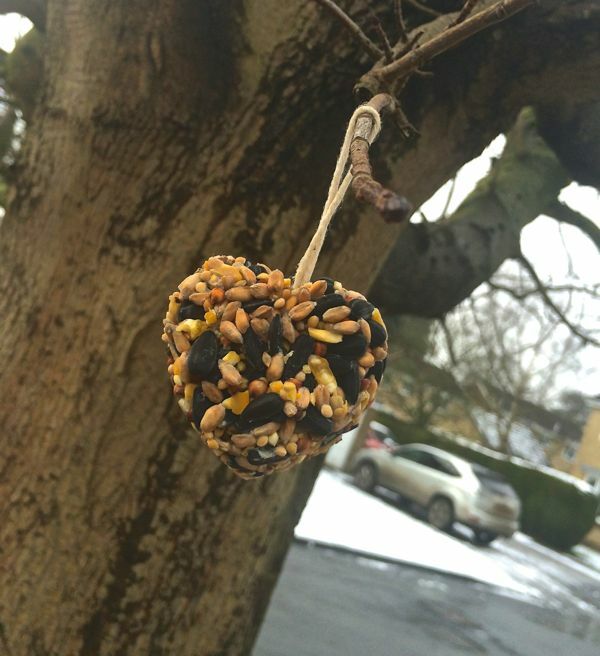 So, back to my bird feeder idea (or rather interest’s bird feeder idea) : this looks so fun and it’s practical too. We made one for my in-laws who have a beautiful garden set in a rural village and the boys love to spot birds there. We also made one for the boy’s godparents who has just bought a new house – we thought it would be a nice touch! Of course, we kept one for our house too and it will be a lovely treat to hang up on Valentine’s Day. Twine, rope or wire for the hanger – don’t use bright ribbon, as tempting as it is, the birds just won’t come to the feeder if you do! Melt the lard in a saucepan and then transfer to a bowl. Let it cool slightly, until it’s luke warm. 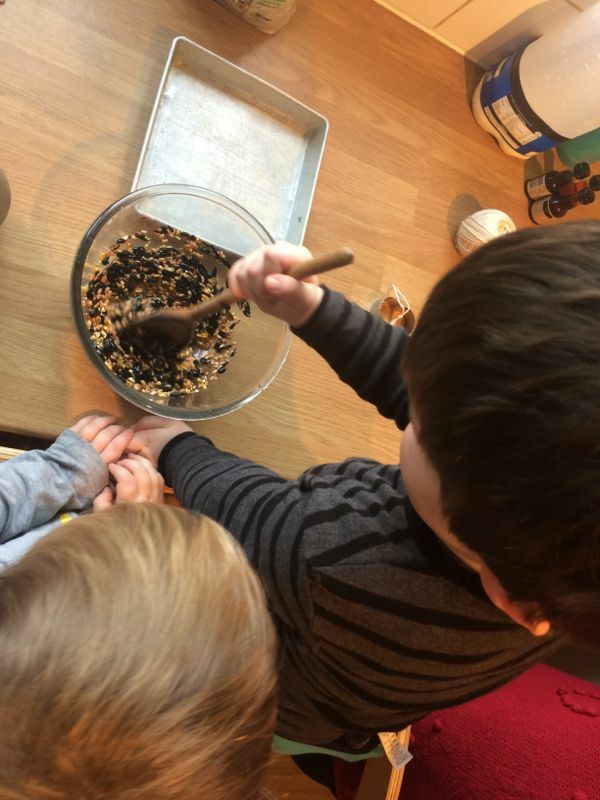 Add 3/4 cup of bird seed and mix very well until seeds are coated. The seeds should be coated but you don’t want lot’s of excess liquid. Spoon the seeds into your chosen mold to the half way point, pressing down to make sure it is well packed. Lay tied twine/wire/string on top of the pressed seed, and fill up the rest of the way so it’s completely covered. Put it in the freezer for a few minutes so you can unmold the ornament more easily without it crumbling. Keep in the fridge until you are ready to hang on your tree! 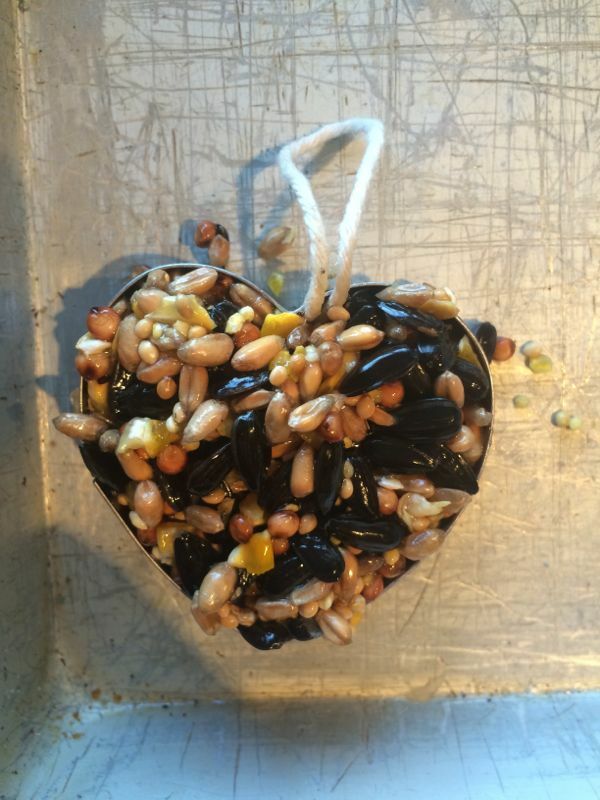 You need birdseed mix (available in most supermarkets or pet stores), a heart shaped cookie cutter or mould, a packet of lard and some string or twine. 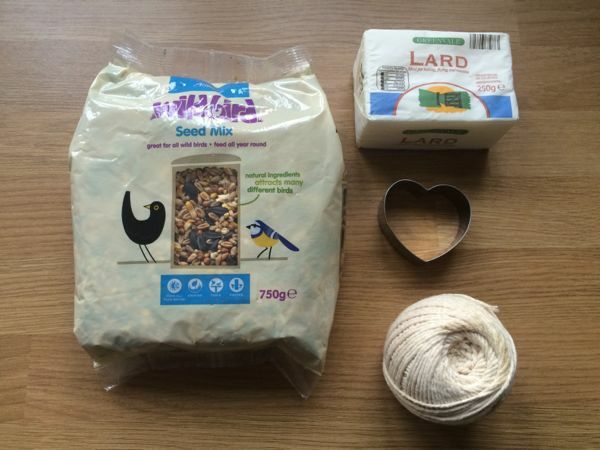 Get your little ones to add the bird seed mix to the melted lard. It mustn’t be too hot at this point as that can be dangerous with little fingers. 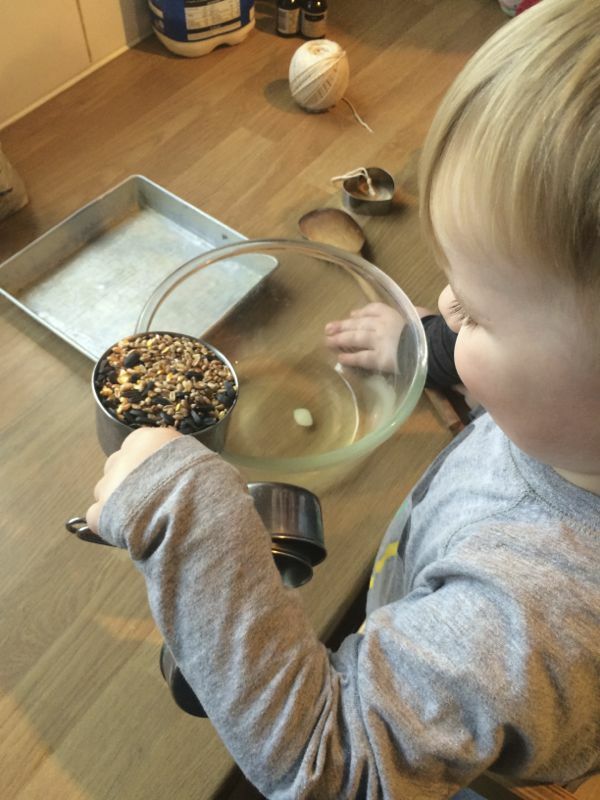 Mixing it all together is always the favourite part in our house! Fill half way and then add you string or chosen hanger. Fill it up to the top with the mixture and you are done, just give it chance to set before you feed the birds! 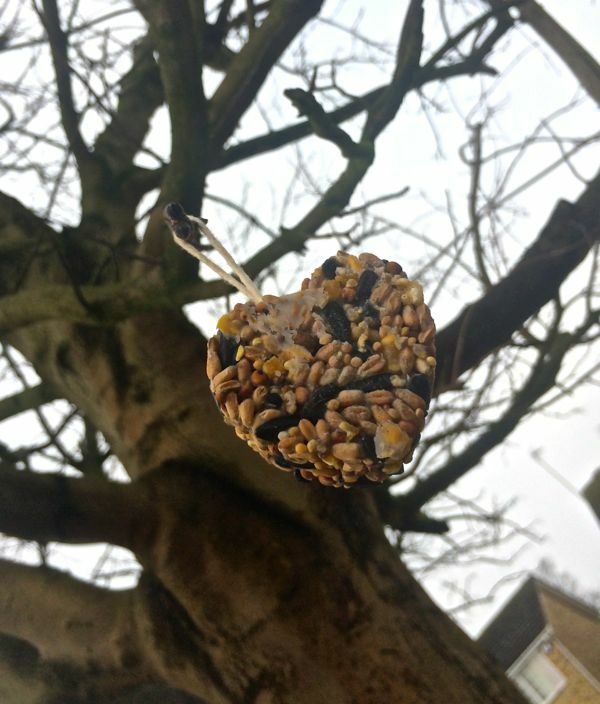 These make a lovely gift for any loved one, or just a really unusual way to give the birds some love over Valentine’s Day!  Enjoy watching the birds with your kids, it’s a great chance to talk about what birds are out there and for little ones of Toby’s age you can talk about bird colours/noises. Next Post Liliputti Coat for baby wearing Mamas everywhere!